This promotion is valid till 21 Apr 2019. 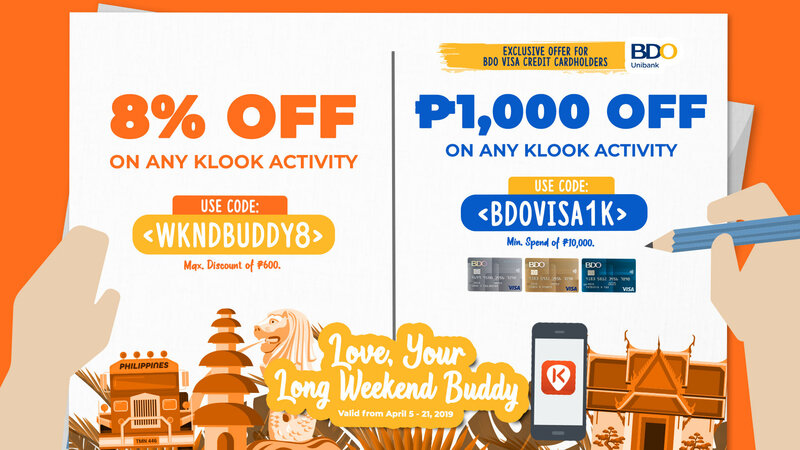 Valid for bookings made via Klook's website and mobile app using promo code "WKNDBUDDY8" and "BDOVISA1K". Promo code is valid for any Klook activity except USJ and JR Pass using the respective promo codes. Promo code "WKNDBUDDY8" is valid for an 8% off discount. Max discount of P600. Promo code "BDOVISA1K" is valid for BDO Visa Credit Cardholders only. Promo code is valid for one-time use per customer only. Promo code is not applicable to Universal Studios Japan, Japan Rail Pass products. Klook reserves the right to suspend, cancel or modify the promotion and term & condition at anytime without prior notice.